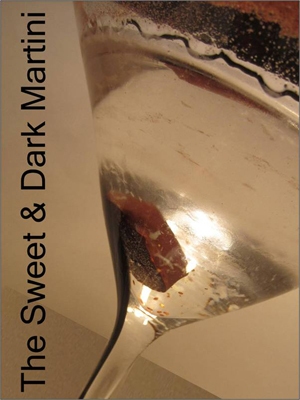 Chill martini glass in freezer for three minutes. Pour a small pile of powdered chocolate onto a plate. Remove glass from freezer and wet the rim with vodka (you can use your (clean!) finger for this). Dip wet rim into the chocolate powder and rotate until covered. Turn the glass upright and place a salted caramel in the bottom. This one is very sweet – you’ll want to enjoy it after appetizers or dinner. Trust me. Go with your gay on this one. In your primary relationship, what ‘sweet’ things do you enjoy talking about? What ‘dark’ topics do you avoid discussing because they are uncomfortable? If you were given a ‘one healthy discussion for free’ card that allowed you to bring up a topic you’ve never discussed with your partner—and there’s no fear of reprisal (no angry or defensive comments, no hurt feelings, just healthy discussion)—what would you talk about? Extra credit: What’s a fact about yourself or memory of some experience that you’ve never shared with anyone? Note: Brand name products are author’s recommendations. Make substitutions as desired. As with all alcohol consumption, please drink responsibly.